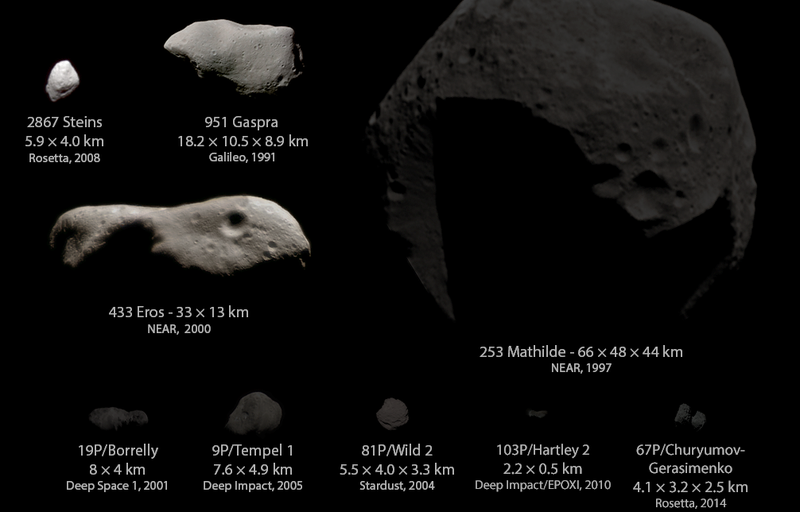 Asteroids in our Solar System are a very diverse group of objects. Some are quite bright and reflect a lot of sunlight (they have what is known as a high albedo) while others are as dark as coal. Each different asteroid reflects light in its own way, and, by recording these differences, scientists can learn about these small distant objects. A montage of some asteroids and comets visited by spacecraft that illustrates the difference in reflectiveness (albedo) in the asteroid and comet population, created by Emily Lakdawalla. Credits for each photo: Gaspra, Borrelly: NASA / JPL / Ted Stryk. Steins: ESA / OSIRIS team. Mathilde: NASA / JHUAPL / Ted Stryk. Tempel 1, Hartley 2: NASA / JPL / UMD. Wild 2: NASA / JPL. Scientists have designed various methods to classify the over 100,000 known and numbered asteroids to make sense of this diversity. The “Tholen classification system” was published in 1989 and it, and other classification systems based upon it (such as the “Bus-DeMeo” classification system), are still commonly used today. In these systems asteroids are placed in to groups based on how the reflect light, specifically their total reflectance (albedo), the difference in reflectivity of different wavelengths of light (generally referred to as the “color” of the asteroid), and the more detailed shape of the asteroid’s spectrum (the “fingerprint” of how the asteroid reflects many different wavelengths of light). The main asteroid belt has a mix of asteroids of many different types with very different albedos and some with very distinct spectral “fingerprints.” In contrast, the outer Solar System (including the Trojan Asteroids population) is dominated by dark (low albedo) asteroids with relatively featureless spectra, with still a lot of diversity in the “color” of the asteroids based on how efficiently they reflect longer wavelength (red) light compared to shorter wavelength (blue) light. As many asteroids reflect long wavelength light more efficiently than short wavelength light, astronomers and planetary scientists often to refer to asteroids as “red” or “reddish” even if to the naked eye they would not appear red. For example, some of the asteroid types found in the main belt and the Trojan swarm are shown below. S-type Asteroids with moderate albedos and an absorption feature longward of 0.75 µm. Based on the sample returned from the Hayabusa spacecraft we can connect some asteroids of this spectral type with Ordinary Chondrites, a common type of primitive, volatile poor meteorite found on Earth. C-type Asteroids with low albedos and linear, generally featureless spectra. These are hypothesized to be made of the same material as Carbonacous Chondrites, a common type of primitive, carbon and volatile rich meteorite found on Earth. The missions OSIRIS-REx and Hayabusa 2 will return samples from C-type asteroids to test this hypothesis. D-type Asteroids with low albedos and relatively featureless spectra with a very steep red slope. Scientists hypothesize that these are rich in organics and volatile elements. The Tagish Lake meteorite is the only sample in our meteoritic collection that is a promising match for D-type asteroids. However, we do not know how representative it is, so very little is known about them. P-type Asteroids with low albedos and generally featureless reddish spectra. Like D-types, scientists hypothesize that these are rich in organics and volatile elements, but they have yet to be connected to any sample in our meteoritic collection. Schematic drawings of then near infrared spectra (covering 0.45 to 2.45 microns) are modified from DeMeo et al. Icarus 202 (2009)160-180. These classification systems have proved to be very useful in helping scientists make sense of the diverse population of asteroids. However, it is important to note that these classifications are arbitrary groupings based upon the appearance of unresolved bodies. Samples and close flybys have been integral in confirming that some of the spectral differences (such as between S-type and C-type asteroids) are clearly related to large differences in composition. For spectral classes where we lack this data, scientists cannot be sure of the underlying cause of the observed variations, or be confident that the arbitrary groupings correspond to fundamental differences in asteroid properties rather than points along a continuous distribution. Lucy will fly by two C-type asteroids (Donaldjohnason and Eurybates), two D-type asteroids (Leucus and Orus), and three P-type asteroids (Polymele and both members of the Patroclus-Menoetius binary). The Lucy mission will be the first mission to ever fly by a P- or D-type asteroid. Getting up close with Lucy will allow us to compare C-, P-, and D-type asteroids and learn about how the composition, amount (and freshness) of cratering, and other asteroidal properties work together in determining the spectral type. These observations will give us a deeper understanding of how and why we see this spectral diversity in our Solar System. Thus the Lucy mission will provide unique and critical knowledge about the nature of these different types of asteroids. As we investigate these primitive bodies—these fossilized remnants of the early Solar System—we will gain insight into our own history and the history of volatiles and organics in our Solar System.